Blessed Homemaking: New Website Address and Apron! New Website Address and Apron! Just wanted to let you know that you can now go to http://www.blessedhomemaking.com to get here! No more typing in "blogspot" because Blessed Homemaking now has its own website address. 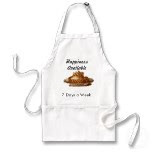 I have also created this cute apron to inspire you to remember that our attitude is a choice we make. If you like it, you can purchase it (it's available in a few different lengths and colors). I can't get a clear picture of the apron here though so you'll have to go check it out at my Zazzle store to see it better. I like that apron in the brown color. Hummm . . . I'll have to see what I can do to get one of those (smiles). I like your new blog header. How do you do that? You'll have to give me lessons sometime. I am glad you like it Lady Rose! And the blog header too. I made this one in Photoshop which came on our computer. It was not easy. I have made other ones on Photobucket before which were much simpler to do.